Books Sunny Days: An Autobiography, Straight Drive, Sunil Gavaskar Omnibus, Khela aura khil??? Sunil Manohar "Sunny" Gavaskar pronunciation (born 10 July 1949) is a former cricketer who played during the 1970s and 1980s for the Bombay cricket team and India. Widely regarded as one of the greatest opening batsmen in cricket history, Gavaskar set world records during his career for the most Test runs and most Test centuries scored by any batsman. He held the record of 34 Test centuries for almost two decades before it was broken by Sachin Tendulkar in December 2005. 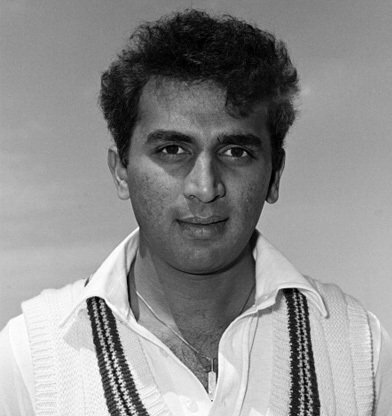 Gavaskar was widely admired for his technique against fast bowling, with a particularly high average of 65.45 against the West Indies, who possessed a four-pronged fast bowling attack regarded as the most vicious in Test history. His captaincy of the Indian team, however, was less successful. There were incidents like crowd displeasure at Eden Gardens in Calcutta leading to multiple matches being disrupted, in response to the poor performance of the Indian team. Turbulent performances of the team led to multiple exchanges of captaincy between Gavaskar and Kapil Dev, with one of Gavaskars sackings coming just six months before Kapil led India to victory at the 1983 Cricket World Cup. In 2012 Gavaskar was awarded the Col CK Nayudu Lifetime Achievement Award for Cricket in India. On 28 March 2014, Supreme Court of India, appointed Gavaskar as the Interim BCCI President primarily to oversee 7th Season of Indian Premier League. The Court also directed him to relinquish his job as a Cricket Commentator. Gavaskar was captain of the Indian team on several occasions in the late 1970s and early 1980s, although his record is less than impressive. Often equipped with unpenetrative bowling attacks he tended to use conservative tactics which resulted in a large number of draws. During his tenure, Kapil Dev emerged as a leading pace bowler for the country. He captained India to nine victories and eight losses, but most of the games were drawn, 30. In a notorious ODI performance in 1975, he opened the batting and managed just 36 (not out) off 174 balls (scoring just one four). Replying to Englands 334 from 60 overs, India managed only 132 for 3 from the 60 overs. It was printed in a local Indian newspaper that,"England won but could not get Gavaskars wicket. "(in Hindi) Which was mainly due to outside the leg stump bowling from English bowlers, which is considered wide in ODI these days.But contradrictily scored 64 runs in 14 consecutive balls also in a World Cup 12 years laters against New Zeland. Sunil is a Brahmin. He is married to Marshneill Gavaskar (née Mehrotra), daughter of a leather industrialist in Kanpur. Their son Rohan was also a cricketer who played some One Day Internationals for India, but could not cement his spot in the team.